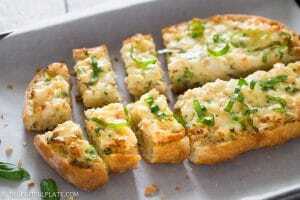 This baked shrimp toast features rich and creamy shrimp mixture on top of crispy bread. 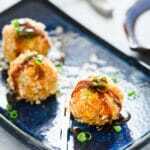 If you are looking for a quick and easy appetizer for your next party, give this a try. There’s a non-traditional Vietnamese dish called “banh mi quet tom” that has a mixture of shrimp and mayonnaise spread on baguette slices. The baguette slices are then baked until golden and crispy. This baked shrimp toast is my version of that dish. 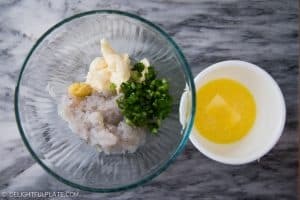 The main ingredients to make this dish are bread, shrimp, garlic, scallions, black pepper, mayonnaise, and butter. I also like to serve it with fresh basil because of its sweet aroma. Regarding bread, I used ciabatta for the photos in this recipe. I have also tried baguette and it works too. Generally, I think just stick with crusty bread and it will turn out fine. You can cut baguette vertically into thin slices or divide in half horizontally. For ciabatta, cut in half horizontally. Regardless of choice, each slice/half shouldn’t be too thick. I like to keep them under 1 inch thick. Shrimps are chopped into small pieces and mixed with mayo, butter and aromatics. Please feel free to chop the shrimps as large or as small as you want. I think shrimps don’t go well with cheese since the heavy and strong flavor of cheese easily overwhelms the sweetness of shrimp. In contrast, the slight tanginess of mayonnaise and richness of butter pair better with shrimps. 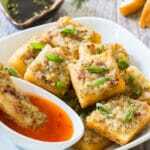 I know a lot of Viet cooks in the U.S. use cheese instead of butter to make baked shrimp toast, so it’s probably a matter of preference. 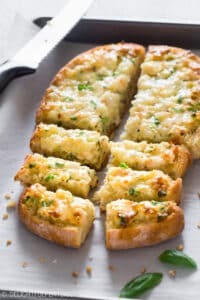 If you like shrimp and cheese combination, you can use cheese instead of butter or sprinkle some cheese on top and broil until melted and golden. Finally, Thanksgiving is approaching and this will be my third Thanksgiving in the U.S. In previous years, I usually looked forward to it as a great time for traveling. On the contrary, I hardly think about it this year since this blog, though still tiny, has occupied pretty much all of my free time after work. 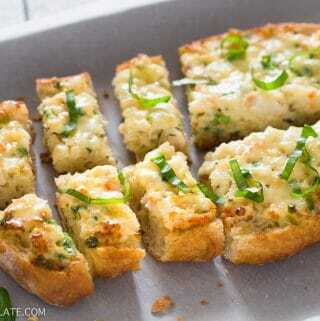 When I tested this recipe, I thought this might be a tasty and easy appetizer for Thanksgiving celebration (as well as other holiday occasions like Christmas and parties). I’m not sure what I will do on Thanksgiving day this year, but I will enjoy Black Friday shopping for sure :). Happy Thanksgiving to those who celebrate :)! I’d love to hear what you think about the dish, so please feel free to leave a comment. 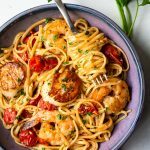 I add new recipes every week so let’s connect on Facebook, Pinterest and Instagram for the latest updates. Chop shrimps or process in a food chopper into small pieces. Don't process into a paste. Mix shrimps with mayonnaise, melted butter, grated garlic, scallions and a generous amount of black pepper. Slice ciabatta or baguette in half horizontally, or cut baguette into thin slices. Each slice/half should not be thicker than 1 inch. Spread the shrimp mixture on the cut side of the bread. Place into the oven and bake for 15-18 minutes or until the top is golden and bread is crispy. Remove bread from the oven. Sprinkle fresh basil and serve immediately. The amount of shrimp mixture in the recipe is enough to spread on one half of a 6''x8'' ciabatta bread. It's enough for 10-15 slices of baguette, depending on how big each slice is. I think shrimps don't go well with cheese, but if you have no problem with shrimp and cheese combination, you can use cheese instead of butter or sprinkle some cheese on top and broil until melted and golden. Thanks, Sophie! I was looking for an easy-to-make Thanksgiving appetizer that was a little different and I’ve found it in your Shrimp Toast. 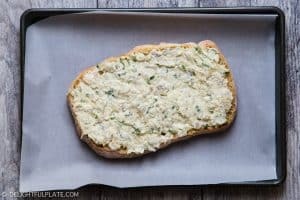 I’m going to experiment with a focaccia bread that I happen to have unbaked in my freezer before I roll it out to the family. I’ll par-bake, add the shrimp spread exactly as written, then finish. I will try to remember to follow up here in the Comments to let you and your readers know how the focaccia worked. Thank you so much for leaving me a comment! Please feel free to let me know how it turns out for you with a focaccia bread :). Thank you for Posting your Recipe! Your Recipe sounds extra delicious as opposed to similar Recipes I’ve seen for Shrimp Toast & I will serve it as a Thanksgiving Appetizer, etc. etc. !! I can’t wait to try it!!! Thank you so much for your comment! I hope the recipe turned out great for you :). I’ve been searching for a shrimp toast for what seems like forever. Then I found your recipe. The rest like they say *is history* It was yummy and easy to make ahead. Thank you for sharing. Thank you so much for the feedback! I’m very happy to hear that you enjoyed the recipe :). This was fabulous. We are originally from South Louisiana so I did add. Little cayenne pepper. Other than that it was a winner! Thank you! Thank you for leaving me a comment! I’m so glad to here that you like the recipe :). Happy holidays to you and your family! I have never made this with precooked shrimps. I think you can bake the bread halfway through, and then add the mixture with precooked shrimps so that the bread will be crispy and the shrimp won’t be way overcooked. 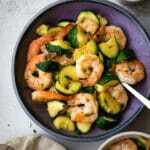 If you try this with precooked shrimps, please feel free let me know how it goes :).